Forget hanging the washing – have a cup of tea while your kids try these ideas! 1 Dress-up peg dolls: put a smile on your kids’ faces with these DIY dolls. You’ll need: wooden dollypegs, paint or felt tips, glue, tape and paper (we used tissue paper and wrapping paper). Plus, whatever you have in your craft box – eg. gems, sequins, pipe cleaners. 1. Get out the paints or felt tips first so your children can draw faces and hair on the peg dolls. 2. Now they get them all dolled up! • They can wrap a piece of tissue paper around the peg to make a dress, and tape it at the back. Add gems. • Paint the top and legs different colours to create clothes. • Try getting them to draw and cut a dress or T-shirt shape to glue to their doll. 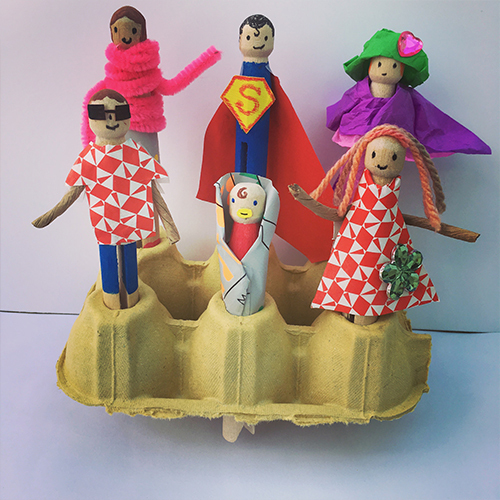 • Or paint the whole peg blue, cut out an S and a cape from paper, and create a superhero! • Paint a baby’s face with a dummy. Wrap around paper to make a blanket. • Wrap pipe cleaners to create clothing. Or wrap them around tissue paper to create interesting shapes. • Fashion fabulous hats with tissue paper. We’d love to see your dolls! Share them with us on Instagram or Facebook. 2 Matching socks game: a perfect idea to help toddlers practise matching. You’ll need: paper, crayons, scissors, string and pegs. Ask your child to draw lots of pairs of socks in different colours and patterns and snip them out. Tape or tie up the string at their height. Now, they hang up the socks in pairs on the washing line. 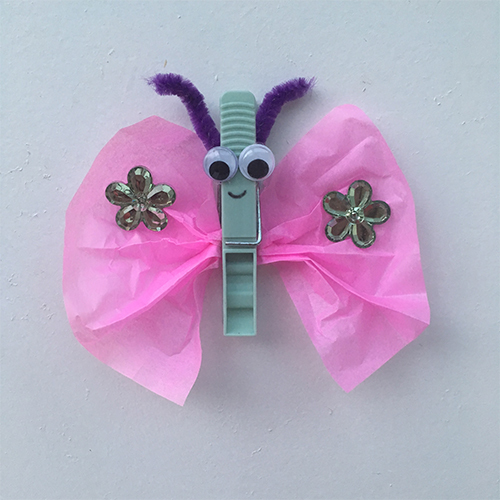 3 Wing it: a peg makes a perfect butterfly body. You’ll need: paper (we used tissue paper), peg and googly eyes. Plus, pipe cleaner and glue (optional). 1. Ask your child to fold the paper back and forth like a fan. 2. Now they pinch the middle with a peg and open it out to create wings. 3. Then they stick googly eyes on the peg. 4. Finally, if you have one, they can bend a pipe cleaner and glue it to the top of the peg to make antennae. 4 Snappy crocodile: kids will love this croc with moving jaws. You’ll need: paper, scissors, glue, a standard squeezy peg and a googly eye. 1. Your kids put their peg flat on paper with the squeezy end to the left and draw around it with a pencil. 2. 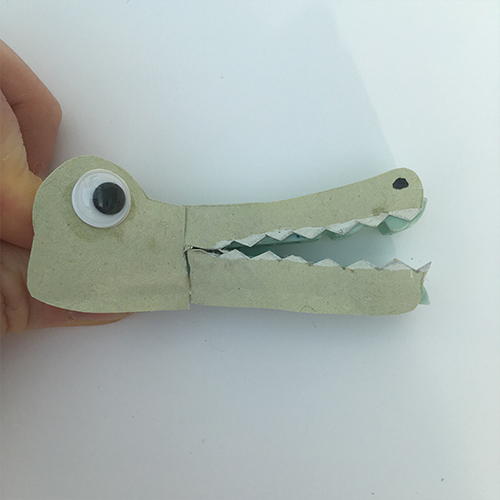 Then they lift the peg away and turn the outline into a crocodile’s head, with the googly eye to the left and the jaws to the right. 3. Now they cut out their croc – snipping along the jagged teeth, too. 4. Finally, they glue the head to the peg and squeeze to see the jaws move. That’s it! A happy snappy croc in 4 easy steps. 5 Wash and dry: or, get the kids to do the washing for you! Give them a bowl of soapy water, some socks (or dolls’ clothes), a washing line and pegs. Then leave them to it while they scrub the clothes and hang them out to dry.